Robert Marzano, a leading educator, and researcher analyzed the standards in the U. S. education system and determined that in order to cover them all, we would need to add 10 years to our current K-12 education system. He found that teachers have approximately 200 standards to cover each year. They have 5.6 hours of classroom time each day, which equates to 1,008 hours available each school year. Out of those 1,008 hours, only 696 hours are available to instruct because you have to take into consideration recess, lunch, convocations, and the array of other disruptions that happen daily. In order to teach all of the standards to the degree of retainment, a teacher would need about 1,192 hours of instruction time. That’s a deficit of 496 hours in a year’s time. No wonder, as teachers, we are drinking too much (and not only on the weekends, eating too much chocolate, and ready to jump off the next bridge at times). I’ll never forget my first year of teaching. The day before school, the teacher next door came over to my room, handed me the Social Studies textbook and said, “Strobel, you have to free the slaves by Christmas.” I panicked as I flipped through the textbook to see all that I was supposed to cover in a given year’s time. Thankfully, I spoke to my mentor and she relieved my anxiety by saying, “Your goal is not to cover all the content at surface level comprehension. Take a breath and let’s talk.” Whew! But you know what? We do have too much material to cover in a year’s time. I always felt defeated because it seemed like I would walk out the door some years and say, “This year I was a really great math teacher, but I let writing slip.” Then the next year, I would concentrate on being a stronger writing teacher, and then, in a result, feel like I had slighted Social Studies or another subject area. It wasn’t until learning about Standards-Based Grading and reading everything I could get my hands on concerning Robert Marzano, Rick Wormeli, and others that I began to see the light. Follow me, and I will take you towards the light. Robert Marzano explains that we have to prioritize our standards. We have to clearly articulate and identify what students need to know, and be able to do as a result of our schooling. These are most commonly referred to as our “standards”. But, as you can clearly see there are more standards than can be taught in the available instruction time. This isn’t the only issue with the standards. A target element or skill also needs to be acquired, but additional skills needed in order to master the specific standard aren’t specified. This is sometimes referred to as the “learning progression”. For example, if you are teaching students how to tell time to the nearest 5 minutes, there are several simpler skills needed in order to do so. They need to know how to count by 5’s, what the numbers on the clock represent, the difference between the hour hand and minute hand, a.m. ,and p.m., etc. 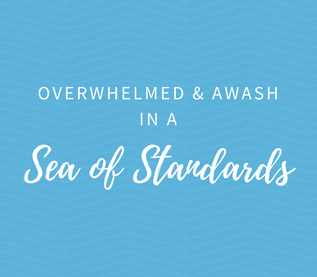 Relief came when I discovered that I could prioritize my standards and didn’t have to teach each of the standards with the same depth. If there are approximately 30 standards per subject area, you might prioritize 12-15 of them and teach the remainders as subcomponents of the priority standards. You also might teach them separately, but spend less time on them. When I coach schools through this process, we decide which standards are priority ones which will receive 50-75% of our instruction time. The next tier of standards might receive 25-50% of our instruction time, and the last tier will get 5-10% of instruction time. By prioritizing standards, teachers feel relief and can focus on skills that will have the highest impact and success for our students. You simply can’t teach all the standards the same and expect students to retain the skills and processes. Marzano also has a great approach for utilizing proficiency scales. Proficiency scales articulate the learning progressions for each priority standards. Learning progressions describe how students’ learning develops over time. These scales are similar to rubrics and describe what skills students need at varying levels of performance for each priority standards. There are so many things that I’ve learned and implemented when it comes to transforming our current grading system. That we even use a 100 point scale is a flaw in the system. In the 100 point system, 8-10 points are reserved for the A and 60 points are reserved for the F. We’ve set kids up to fail on this scale, and there’s little room for success. We also average scores, which means we don’t give credit for the learning that takes place within a 9-week period. A final score on the report should always reflect what a student knows and understands right now… not what they didn’t understand early in their learning. She was still a 64% (F) according to the gradebook. When in all reality, she was scoring in the 80’s for her last two tests. A grade should always represent what a child knows and understands right now or at least based on the latest trend of scores. As you can see, I’m extremely passionate about Standards-Based Grading, the growth it shows for our students, and how it can contribute to their learning in the world of education. And really, what does a ‘B’ in math really mean at the end of the day? It doesn’t mean a lot to the student, the teacher, or the parents. If you want to learn more about any of this and how to take a few things off your plate, join me! Registration for my Fall Workshops is open!